Looking for a comprehensive beginner's guide to SEO? Check out Dan Richmond's "SEO in Practice", a step-by-step manual on how to drive a website to Google's top. A free digital copy of the guide is already online! Dan Richmond is a seasoned SEO professional who has been practicing SEO for almost 10 years now. In his SEO guide, he offers only battle-tested SEO techniques that have helped hundreds of his clients to achieve top Google positions. Don't miss this gem of advice! The extensive SEO expertise is compressed into 6 chapters of practical SEO guidelines, seasoned with real-life stories and visual screenshots. Besides, at the end of each chapter, there is a quiz that lets you quickly check your newly acquired SEO knowledge and helps it sink in. What makes "SEO in Practice" stand out among other SEO guides is that it really leaves you armed with all the SEO knowledge you need to start promoting your website right away. It does not merely compile another SEO ABC for you - it really teaches you effective SEO practices, providing real-life parallels that help you understand some not-that-easy-to-grasp, yet indispensible SEO concepts. 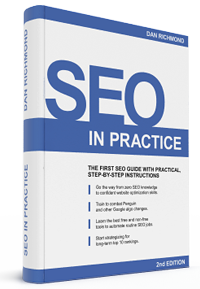 And, the guide is not just a collection of random SEO tips and tricks. It takes you through all the stages on the SEO process - just in the order a practicing SEO would normally carry them out. The guide begins with keyword research, which is the starting point of any SEO campaign, moves on to site structure and content optimization issues, then touches upon the cornerstones of link building and, finally, explains how to create social media presence for your site. Can't wait to try it out? Get on board. Master expert SEO techniques in no time with the one-of-a-kind SEO guide today!